How far will you go to save your loved ones? How can you save your precious people from leaving you? there might be a way of counselling, compromising or any other way. 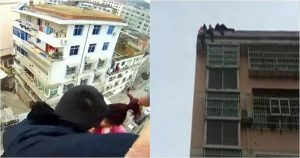 But what this Chinese man did to save his wife is quite amazing, the way he saved his wife from committing suicide will make you feel that this might be the edge of the hope. Now, coming to the story, out of family’s personal issues, the women who felt deeply distressed decided to end her life. She hurried onto the top of the 65 feet tall building and jumped off the building. But something strange happened now, yes! something that can be seen only in movies. Her husband took hold of her ponytail with his right hand, she screamed ‘let go’ but his determination to have her for the lifetime was too big compared to her will to die. He held her with her ponytail for about 3 minutes, which is quite tough. However, the police arrived after someone informed the incident, they helped the couple. As the video is found in CCTV footage, it is now going viral on social media. Some were shocked to see him holding her for such a long time, just with the ponytail, meanwhile, others appreciated him for his quick thinking.